Doors that are opened and closed by sliding sideways in a line parallel to the wall. Usually operate suspended from the top or rolling on the bottom, on purpose made tracks and rollers. These doors can fall into quite a few categories, one major division is manually operated doors, and doors that are opened and closed by machinery of some sort. This page discusses doors that are moved by hand. Sliding Doors : Some of the possible combinations of sliders. The range of these type of doors is enormous. They can he huge, as in the doors for aircraft hangers, that have the tracks extended outside the building itself so that the whole of the end of the building can be opened, to small shaving cabinet doors that run on plastic tracks. 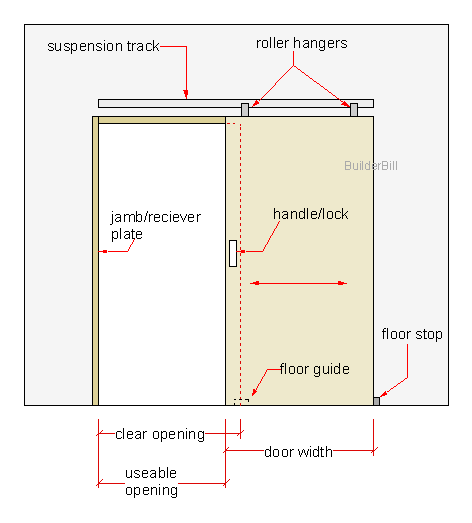 Of note here is the sketch of a pocket door which is becoming popular for domestic use in stud walls. Quite inexpensive systems are available. Also something that I have not seen yet although the tracks and fittings are readily available are the curved sliders. 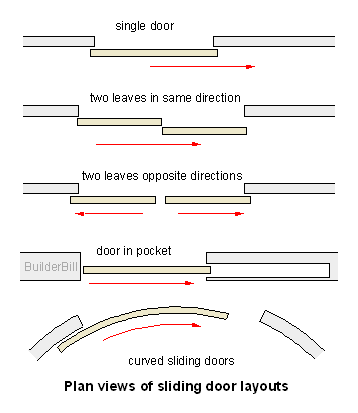 A typical timber sliding door and some of the terminology. Above is a sketch of a common type of interior domestic door. 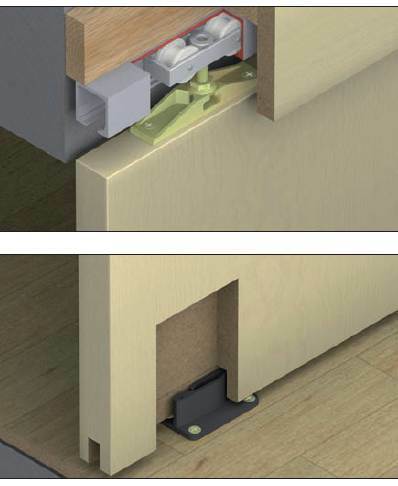 In a domestic situation the slider is used mainly to save space. In my opinion for domestic use a standard swinging door is the most convenient as they are easier to open and close, but in many cases their ability to work in tight spaces is a must. A lot of doors used for sliders like this, are the same standard sized mass produced ones that are used in the rest of the house. When used for foot traffic they follow this pattern of being hung from a top track, with a groove in the bottom of the door so that a that a floor guide can be used to control the bottom of the door without any need for unsightly floor tracks. When there is no foot traffic through the doors as in wardrobes and cabinets then it is common to see doors that use bottom rollers running inside or on tracks. It is normal with doors like this to fix a pelmet, or a fascia as it is sometimes called to the top to cover the track. Note also that the door does not slide all the way open, it has to have part of it left available for the handle to be used on the other side. Cut away sections that detail top track and bottom guide. What you see above is one of the many systems available on the market today. This particular one is suitable for doors thicker that 30mm and up to 40kg in weight. Sliding Doors : Showing what is possible with modern doors and hardware. 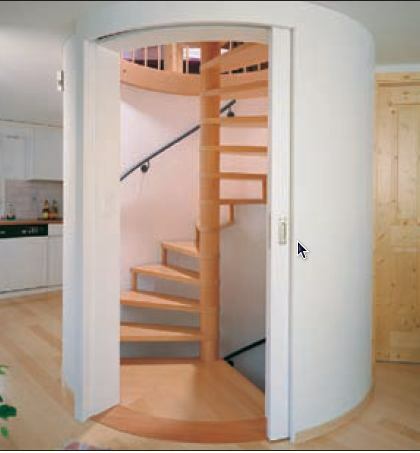 Something that I have not seen before, enclosing in the helical stair to in effect form a circular stairwell. Which in terms of energy conservation and space saving is absolutely brilliant. 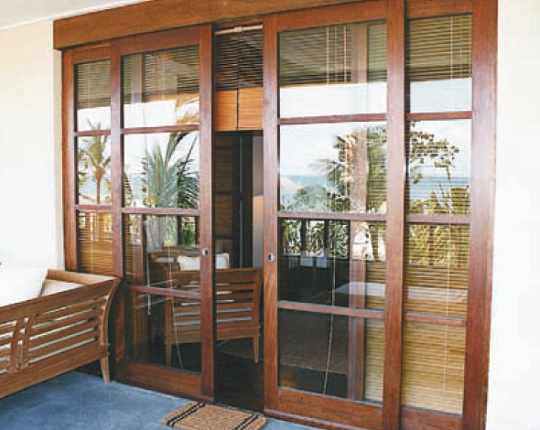 Sliding Doors : A pair of external patio doors. Once again a shot showing the main advantage of sliders. Swinging doors to a patio like this would be an inconvenience because they would simply take up too much room. Sliding Doors : A bottom roller and track to a steel gate. 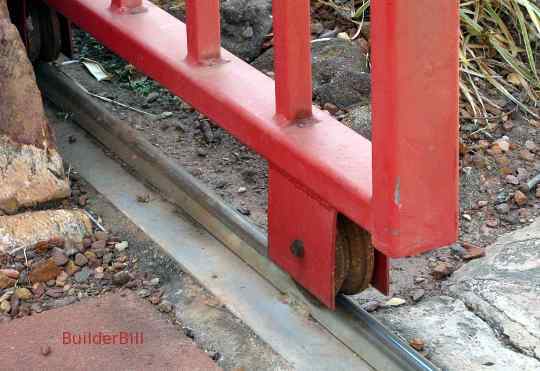 Above is a quite solid steel roller that is supporting a fairly heavy steel gate. The track it is running on is an inverted "T" section welded to a plate that has been cast into a concrete pad.